This posting is a little “late to the press” but I thought I would follow tradition and post a what’s new for SAP BusinessObjects 4.1 SP5. Most of the important details are listed in the What’s New Guide on help.sap.com. However I did find that a major enhancement had been implemented in the SAP BusinessObjects Explorer 4.1 SP5 plugin. From what I can tell, this enhancement was not listed in the “What’s New” guide. I was actually notified of the enhancement through ideas.sap.com. So what is the major enhancement? 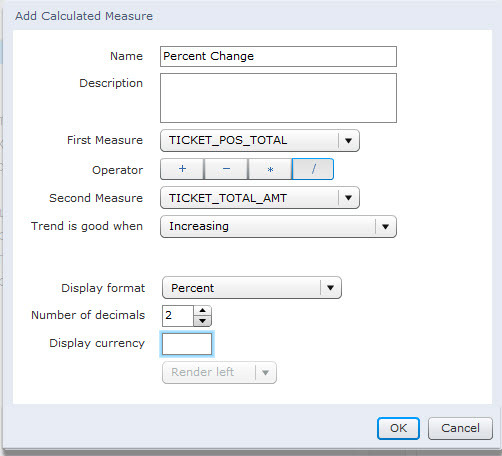 Drumroll please……you now have a few formatting options when defining calculated measures within an SAP Explorer Information Space. You can now format calculated measures defined in your SAP Explorer Information Space. Previously you only had formatting options when your information space was based on a Universe. The Information Space would inherit the formats defined on the measures derived directly from the Universe. However, calculated measures (those defined in the information space) had no formatting options. This was of particular importance when BWA or SAP HANA were the prescribed data source (IE… No Universe was utilized). One of the most common KPI’s used by business is % Change. 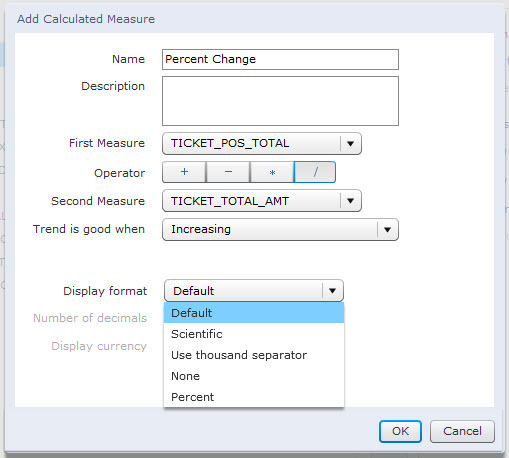 To calculate percent change in Explorer, you have to first define its numerator and denominator as separate measures in the source. Using a calculated measure, you could then perform the division to produce a raw change ratio number. Without the ability to format the number in the presentation layer, business users had to view the measure in its raw decimal format. For example, they would see .3354 in an Explorer Chart or table. What they really desired was the ability to view the measure formated as 33.5%. While this might seem like a trivial feature, I can attest that multiple customers found this to be a huge issue. Business user want to see the KPI in “%” format. “That is how it has always appeared in previous tools”. Fortunately SAP finally added the feature in SAP BusinessObjects Explorer 4.1 SP5. There are a few other changes in SP5 as well. You can now define Web Intelligence customizations on the User Group and Repository folder level. This means that you can pick and choose the Web Intelligence UI buttons that are visible based on group membership or folder location. Unfortunately it is now impossible to figure out the forward fit plan for 4.1 SP5. SAP Note 2103001 tries to explain the new forward fit process but your guess is as good as mine. Maybe this posting will get some feedback explaining how to determine the forward fit for a patch or support pack?